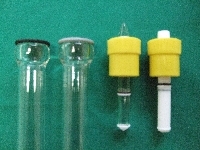 The wide variety of O-rings are used in same parts such as greaseless stopcock and ball joint etc. And these O-rings maintain stable high vacuum state, even though it is greaseless. Some O-rings are even interchangeable. But only PTFE coated O-ring is not interchangeable because of unique and patented process. Although different types of O-rings such as FKM, PTFE and fluorine resin coated O-ring are used mainly, we can also offer another kind of O-ring. Please contact us. This is the table for main spare O-ring. We can also offer another unlisted O-ring. Please contact us. According to the following procedure you could replace old O-ring with new one by special "Jig(ORZ/-)". Please note that PTFE is so soft that it will be made a scratch easily. Please prepare a suitable jig for size of O-ring which you want to change. 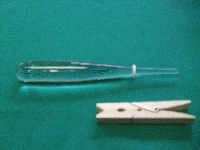 For more information about jig, a tapered glass tube and a knag, please check the page of "Clip and Jig". Please insert O-ring to the tapered glass tube and push it to expand by the knag. At this time if you would push by finger, it will acquire fat and dust on the surface of O-ring. Please set up the expanded O-ring in proper position, and oven-fry or heat with a burner. Please blot the O-ring to clean up with soft cloth.